Having lived at Whaley’s Crossroads for most of my life, I’ve always been interested in the history of the land that I call home. Who lived here in the past? Who was the first? If there were old, forgotten houses, where were they? Were today’s fields yesterday’s woods, and vice versa? What routes did the early roads follow? What did the land look like during the colonial era? With the help of early maps, land records, wills and other genealogical records, and software, I’ve been able to answer some of these questions, but there is much that remains unknown. The Pomeroy & Beers Atlas of 1868, which features local roads, waterways, houses and their owners’ names, and other structures, is incredibly useful — but 1868 isn’t all that early when one considers that there was English settlement activity in the neighborhood in the early 1700s. My goal is to use the atlas as a starting point and work backwards towards the original Maryland surveys, and connect as many dots as possible in this mostly forgotten period of 150+ years. For this article, I’ve used Plat Plotter, Inkscape, and Google imagery to create a series of maps to demonstrate how I visualize overlapping surveys and resurveys from the same neighborhood. In theory — my theory, at least — the overlapping area(s) between different early surveys of the same tract of land can be viewed as a Venn Diagram, of sorts. The unchanging core of a plantation over the course of decades probably includes the site of the primary dwelling house and/or the most desirable land. As successive owners buy and sell parcels of surrounding land, they create new property lines which can be compared to the older property lines, and — again, in theory — we should be able to make some educated guesses about where the core of a plantation may have been during a particular period. All of this sounds very confusing, even to me as I’m writing about it. This is better shown than described. 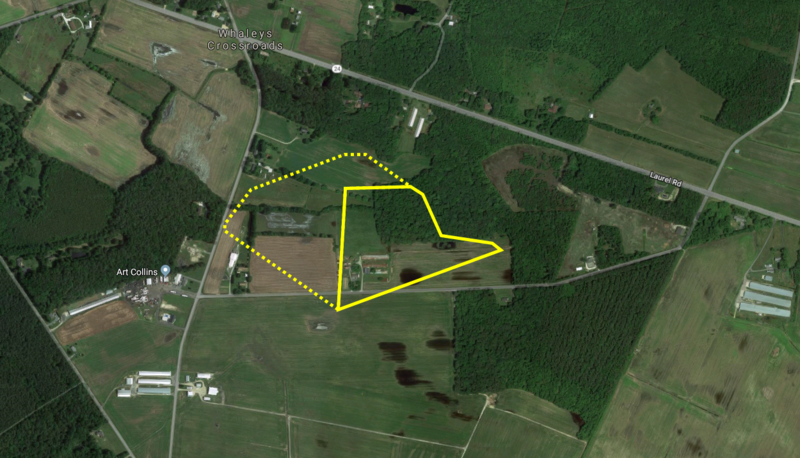 This is a resurvey which begins with the original, diamond-shaped 50-acre tract (D), takes away several acres which are part of an overlapping “elder survey” (C), and adds vacant land (B), resulting in a new tract. The rest of the certificate (not shown) explains that the original tract had been surveyed for James Bowger in 1743, and was named Bowger’s Choyce (or Choice), but “the Afsd. Bowger had omitted paying Caution for the Land” and the original certificate became “null & void.” James Bowger or Bouger remains a somewhat mysterious figure in the early history of the neighborhood; he appears on the tax list for 1723, and, interestingly enough, the 1760 survey of Friendship refers to Bowger’s Mill, which was probably located at Terrapin Pond. He also received a patent for a 55-acre tract called John’s Folly in 1720. 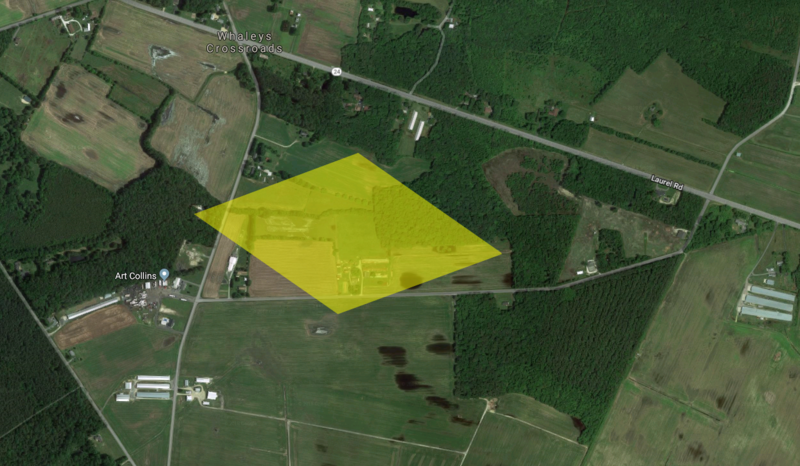 A word of explanation is in order before we look at the next image, which shows the approximate location of Bowger’s Choyce. Although I’ll be presenting the next few maps in chronological order, I had to locate and plot each of them in reverse chronological order. Their locations are based on the boundaries of other parcels of land. To the north, a large tract sold in 1811 bordered land owned by Jonathan Betts, and it just so happened that two pieces of land, which Betts purchased from Thomas Paramore in 1791 and 1792, fit the neighboring tract like a glove. The boundaries of these two parcels, which we’ll look at in a bit, begin with the original bounder of both Friendship and Bowger’s Choyce, and although slight errors in the surveys make it impossible to pinpoint its exact location, we can get very, very close. The boundaries begin at the southernmost point, which, in 1743, was a marked red oak sapling. As I said, there’s a margin of error here, and the tree is long gone, so we can’t be sure of the exact spot, but it’s close. Apparently, Bowger’s Choyce overlapped with another tract — “C” from the plat of 1760 — which I’ve yet to identify. The next image is based on a crude tracing of the plat, since I don’t have any other information about the mystery tract’s boundaries. Though “C” was called an elder survey in 1760, it’s unclear whether it predates the survey of Bowger’s Choyce in 1743. It certainly predates the resurvey of Friendship in 1760. 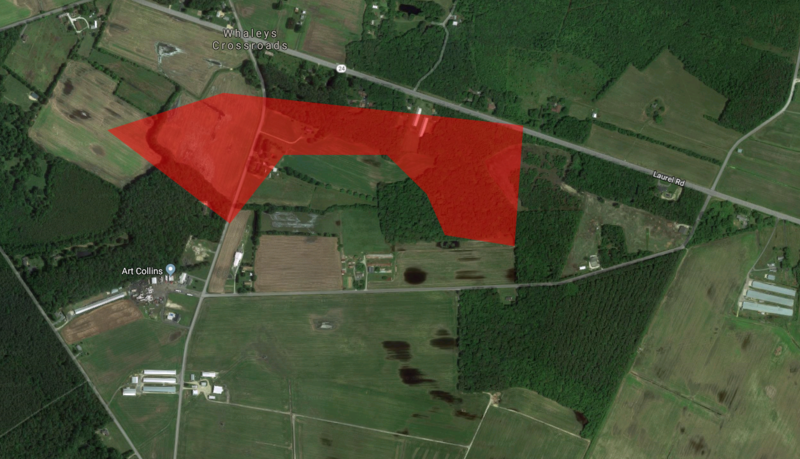 A small section of the tract extends beyond the map. The shape of Friendship doesn’t match the modern landscape in an overtly recognizable way, but there are boundary markers that seem to align with modern features (i.e., roads and tree lines), and may have been used in drawing later property lines. Friendship was resurveyed yet again in 1776, resulting in a much larger tract called Delay. I don’t have the boundaries of Delay to plot it, although it appears on the incredibly detailed and useful maps created by Mike Hitch and the late John Lyon. However, additional records allow us to piece together the history of Friendship/Delay over the next few decades. Worcester County land record indices indicate that Matthew Parramore purchased a piece of land from John N. Saunders in the late 1760s; though the deed itself isn’t available online and I haven’t sought it out, it seems clear that this purchase included Friendship. Matthew Parramore willed the resurveyed version of Friendship to his son, Ezekiel, who, in turn, conveyed it to Thomas Parremore in 1791. (Note that the name Paramore was spelled differently in various records at that time.) Almost immediately, Thomas sold a 100-acre parcel of the land to Jonathan Betts, Sr., in 1791. 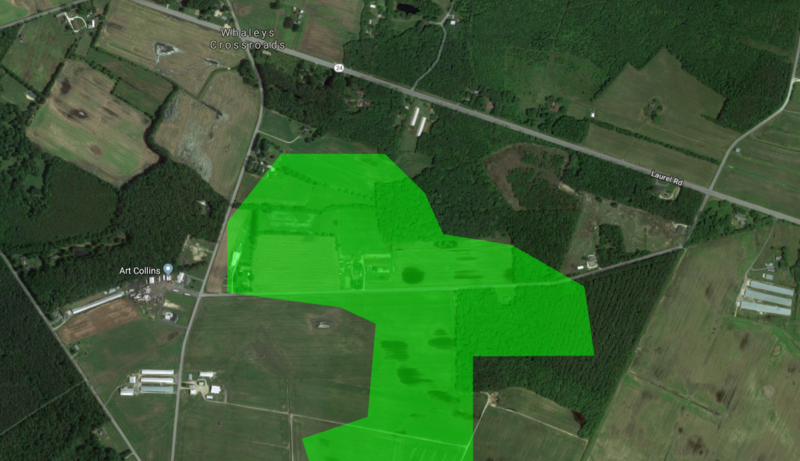 The 1791 and 1792 surveys don’t fit together perfectly, so I’ve erred on the side of matching the 1792 parcel to the tree line along its northeastern corner, which seems to match it perfectly. 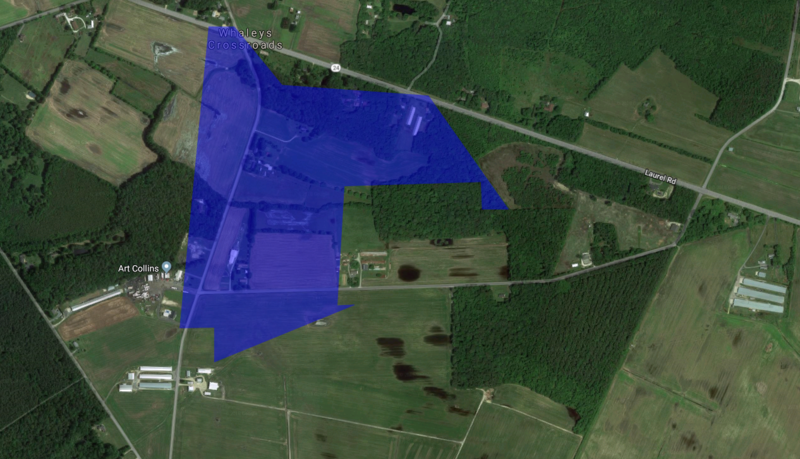 Its westernmost boundary is questionable, however, and actually overlaps the 1791 parcel somewhat. Both parcels begin at the red oak used as the first bounder of Bowger’s Choyce in 1743 and Friendship in 1760. 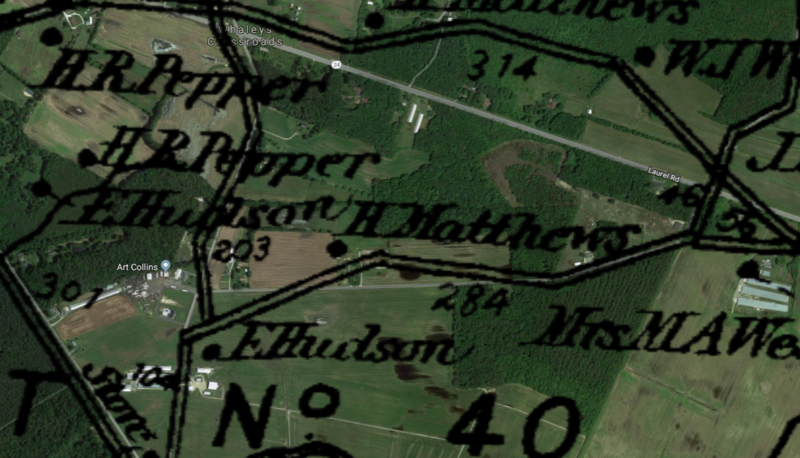 I haven’t quite pieced together the history of the land after Betts acquired it in the 1790s; I suspect it passed to Hezekiah Matthews at some point, because I know his son, Henry Clay Matthews, owned it at the time of his death in 1917. 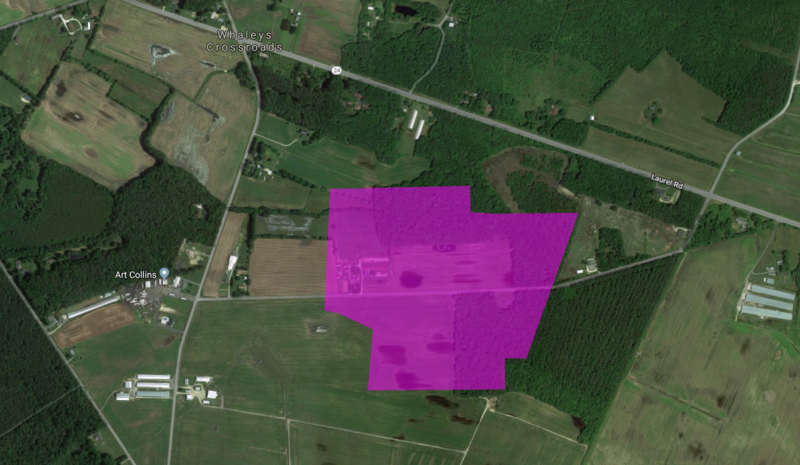 Since then, the old plantation has been divided into increasingly smaller parcels owned by a number of landowners including members of the Mitchell, Whaley, Morris, and Slavens families, among others. — but it still doesn’t tell us much about the way things were 100+ years earlier. To get a better idea, I’ve stacked the images we’ve already looked at. 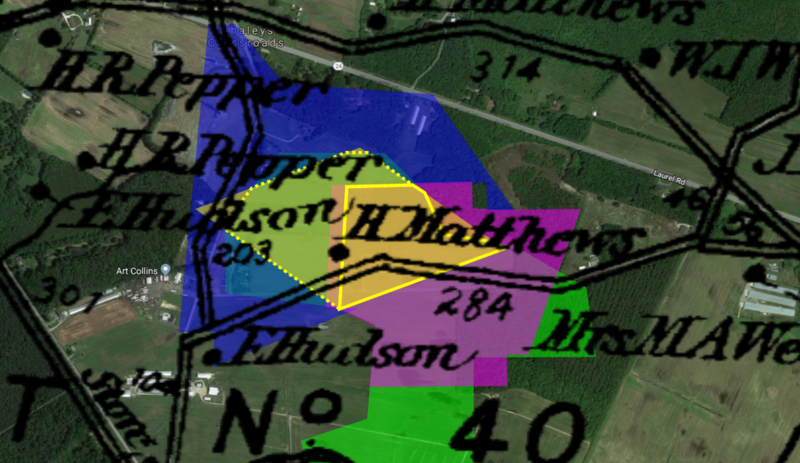 Where the changing property lines overlap, they reveal what may have been the core of the plantation owned by Jonathan Betts, and the Parremores before him, and John Saunders before them, and — possibly — James Bowger before him, although it’s not clear whether Bowger actually did anything with his land between 1743 and 1760. The yellowest area is our “hot spot” (for lack of a better term), not only because it is included in both the 1743 and 1760 surveys, but also because it isn’t included in the first parcel that Thomas Parremore sold in 1791. It seems unlikely to me that he would have sold the most important part of his plantation first. The deeds aren’t helpful, since both vaguely mention housing, fencing, and orchards, which was pretty standard for the deeds of the time, and part of the price of the 1791 parcel is illegible. So I’ve created two images, the first, showing what I consider to be the primary hot spot; the second, showing adjoining land that may have also been considered part of the core of the plantation between 1743 and 1791, yet, for some reason, was sold a year earlier than the land to the east. It’s only my opinion, but I’d like to suggest that the area within the solid yellow lines may have included the earliest and/or primary dwelling house, outbuildings, gardens, and orchards, while the area within the dotted yellow lines may have included early features of less importance; perhaps the earliest fields. I would also suggest that the land outside the yellow lines may have included wooded land and later fields, as the owners expanded and improved their holdings, all while buying and selling surrounding parcels. So we have the earliest known house site depicted in 1868, located on the part of Bowger’s Choyce (1743) that was included in resurveys of Friendship (1760 and 1776) and sold in two transactions in 1791 and 1792. This probably isn’t a coincidence. The overlapping tracts/parcels might also explain why an earlier version of Samuel Hill Road looks like it leads directly to the H. Matthews house before heading east towards Lowe’s Crossroads and Millsboro. It’s possible that this section of the road was built specifically to connect Bowger’s Choyce and Bowger’s Mill, to the south, during the period between 1743 and 1760, if not earlier. Further research might tell us more about the neighborhood, not only as it appeared in the 1790s, when the vacant land was disappearing and the land records are a bit easier to decipher, but perhaps even as it appeared in the 1740s, when only a handful of settlers were establishing plantations in this part of Wimbesocom Neck. We still know little of this early period.